The Wesley Bolin Memorial Plaza, located east of the Arizona state capitol, includes an impressive array of historical memorials. But a memorial dedicated to the Union soldiers who fought in Arizona during the Civil War is conspicuously absent from the plaza. There’s nothing commemorating the California Column which secured Arizona for the Union in 1862. Nine Union soldiers were killed and seven were wounded during the campaign. Please support efforts to get a monument to the Union troops that expelled Confederate forces from Arizona during the Civil War erected on the Wesley Bolin Memorial Plaza. Beginning in 2003, the Sons of Union Veterans of the Civil War (SUVCW) embarked on the Last Soldier Project. The purpose of the project is to locate and appropriately mark the final resting place of the last Civil War Soldier buried in each county/parish and in each state of this great country. Brothers of Picacho Peak Camp #1, Arizona Camp-at-Large, proclaimed Private Parker Louis Gordon to be Arizona’s Last Union Civil War Soldier during a ceremony on November 19, 2005, at the Greenwood Cemetery, Phoenix, Arizona. An important activity of the SUVCW is to locate and register the graves of Union Civil War soldiers. David Jackson is our department’s current Graves Registration Officer and he works to locate and record local Union soldier graves. We have identified the last Civil War veteran buried in Arizona, Private Parker Louis Gordon, and had a ceremony in 2007 at which we dedicated a new memorial marker to him at Pioneer and Military Memorial Park, Phoenix. Gordon was born September 1, 1847, and died December 5, 1946. He served as a private with the 154th Illinois Infantry Regiment. 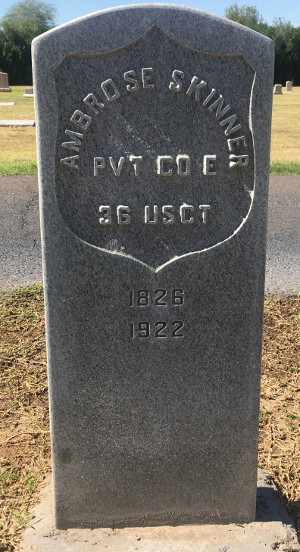 In 2011 we identified the unmarked grave of a Civil War veteran and Buffalo Soldier, Private Ambrose Skinner, who served in the 36th United States Colored Infantry. Through an arduous 2-year period, Jan Huber, our previous Graves Registration Officer, identified the next of kin and worked with the Veteran’s Administration to secure and install a military tombstone for this soldier at Greenwood Memorial Law Cemetery in Phoenix. • School presentations by various Brothers to enrich the elementary and middle-school education of our youth on the meaning and importance of the Civil War. • Camp Historian preserves and shares information about our Camp history. • Auxiliary to the Sons of Union Veterans of the Civil War actively supports the Camp and its own patriotic activities.